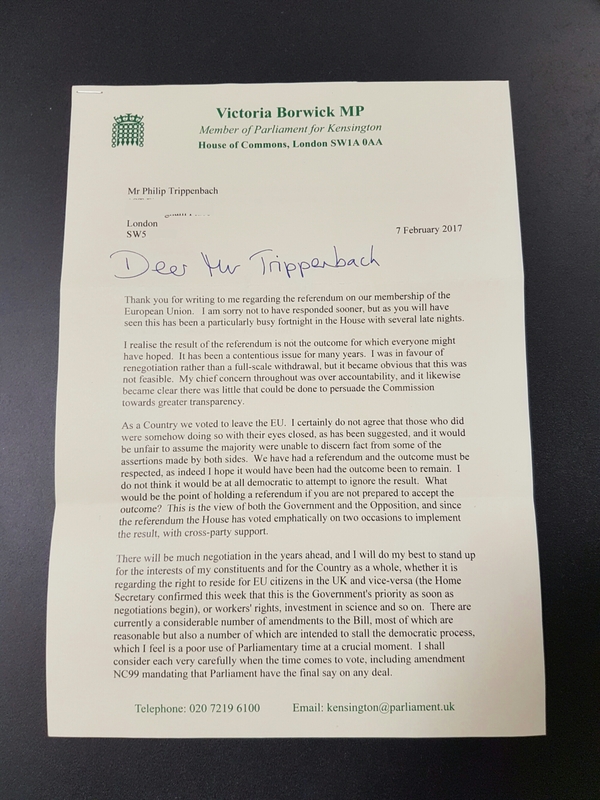 UPDATE: Victoria Borwick, my MP, answered my letter within a week. I’ll append her response after my text. I am one of your constituents, and I am writing to you today because you have an enormous opportunity to stand up for democracy and the rule of law. This week you can make an enormous difference to Britain, and indeed the world. Last year, you campaigned in favour of leaving the EU. This week, as the government introduces its bill on triggering Article 50 and officially beginning the process of exit, I would assume you are minded to support it. That is your right. However, as I will demonstrate, voting in favour of triggering Article 50 now means you would be taking action against democracy and the rule of law. Two things have changed since June 24th of last year, which I believe should lead you to reconsider your position. First, it is now well-established that the various pro-Leave campaigns misled the public. Many voters made their decision based on this false information. This is accepted publicly now, even by many of the former leaders of the Leave campaign. I am sure you will agree that our democratic system cannot function correctly in a climate of distorted facts and outright lies. That is propaganda and manipulation, not democracy. In these conditions, respecting the referendum result is not democratic; in fact, one could say it acquiesces in propaganda and demonstrates contempt for the democratic process. Secondly, since the Brexit vote the United States, Britain’s most important partner outside Europe, has slumped into a political crisis. If nothing else, I am sure you will agree that the American administration’s demonstrated disregard for the rule of law stands against one of the core values of Britain. Disconnected from the EU, Britain will need stronger partnerships in other places. This was brought to the fore with the PM’s trip to Washington last week. In the context of the political upheavals we are now seeing in the USA, and as a proponent of democratic values, can you really stand for detaching Britain’s future from Europe and attaching it more firmly to the USA? In this context, leaving the EU represents neither respect for the will of the people nor a commitment to what is right for Britain. To put it bluntly, supporting the Article 50 bill puts Britain on the wrong side of history. It is not too late. You can stand up for the values of democracy and the rule of law. You can ensure that the world looks favourably on Britain once again. Over the next two days, you can ensure that this country’s commitment to liberal internationalism remains an example for other countries to follow, as it has for so many years. I implore you not to miss this opportunity. 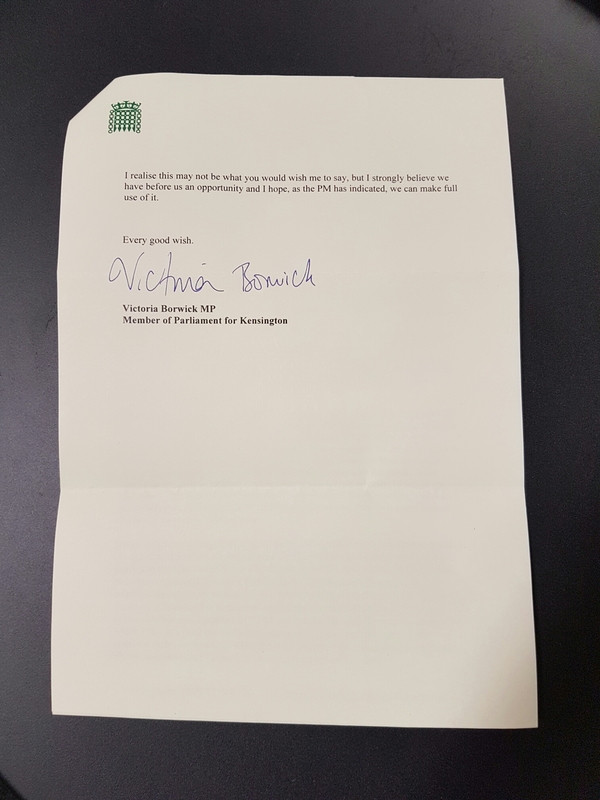 I have copied this letter to my blog and will be looking forward with great anticipation to receiving your response. I don’t agree with everything here, but it’s good to get so comprehensive a reply.